For me and my personal preference around 2DoF motion combined with VR, there are a few vital tweaks required to avoid nausea and to acheive the most immersive experience possible from my particular setup although your mileage may vary as we all perceive things in different ways. I talked about this topic briefly in a few of my videos, but as I am asked for advice/my opinion in this matter frequently, I thought it was time to put pen to paper, or fingers to keyboard as it were. When I opted for 1:1 sFOV and my large 84" wrap around PJ screen, I noticed that the onscreen experience changed somewhat - my cockpit onscreeen was moving around but my physical wheel and digital dash I could see in front of the screen was not and it felt so wrong! I needed to make some adjustments to make it feel right. I needed to make the onscreen cockpit as static as my wheel and dash. The world needed to move around the cockpit in game, not the other way around as I often find people suggesting. world movement MUST be turned up to the max. When I first added g-force based motion to my rig back in April 2014, the changes I had made in game to the artificial effects made even more sense, I did not have to change a thing, it seemed I had stumbled upon the right theory previously. By applyning this principal, I match my seats movements with those in game. For example if I go over a bump, I want to feel the pitch change from my cockpit and I also want to see the world move outside my cockpit. Funnily enough, if you think about VR and Motion, it's 1:1 the same as sFOV and Motion, so again, my previous settings apply! One of the contributing reasons for people to feel nauseous with VR is that the movements they see do not match the movements they feel. I would imagine that without 2DoF Motion the settings above would not apply. 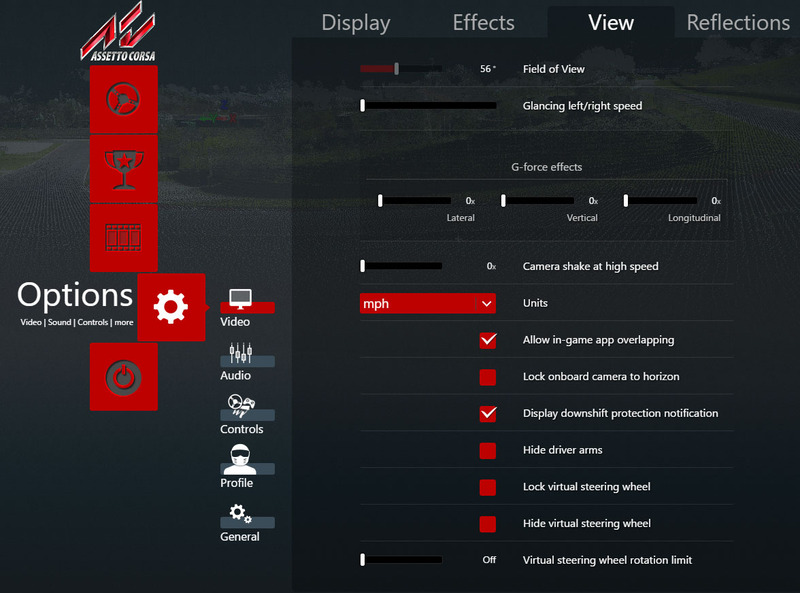 Another benefit of the setup I have, is that the MotionSystems EU have added 'VR headway' to their software to compensate for extreme movements, thus keeping your head in the cockpit where it should be. Good job guys! In just about every game/sim I own the method for applying these settings is different. Over time I will add screenshots and/or mini how-to sections below.